Need a zero waste gift this holiday season? You’ve come to the right spot! All purchases come wrapped in compostable brown paper and hemp twine. I can also include a cute little note from you for the recipient, if you would like. 🙂 Part of CFC’s Vamp Collection! Blood Moon is a dark, cool-toned burgundy with just a hint of silver. 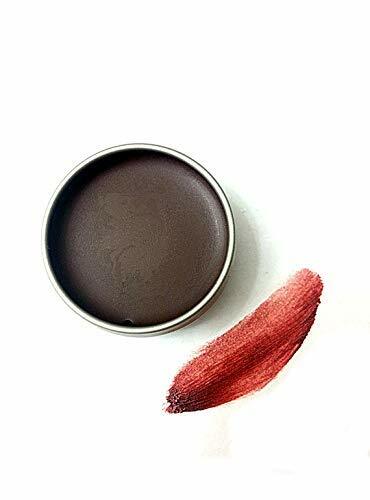 CFC’s vamp lip balms provide a medium/dark tint. Coconut oil and shea butter moisturize while vitamin E oil rejuvenates. Each lip balm comes in a 1/2 oz. container. Ingredients: coconut oil, shea butter, candelilla wax, vitamin E oil, Red No. 40 FD&C Lake, activated charcoal, silver mica This product has not been evaluated by the Food and Drug Administration and are not intended to diagnose, treat, cure, or prevent any disease. By making a purchase you agree to not to hold Clean-Faced Cosmetics or any officer of the company liable for any loss or injury incurred using Clean-Faced Cosmetics products.